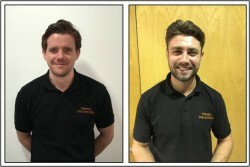 Our Dartford Office, which is responsible for the management of our London high-rise projects and the continued growth of our commercial small works division, has welcomed two new members to the team. Richard Edwards has joined us as Project Manager. Prior to this Richard worked in a similar role at Compco Fire Systems. James Snooks has over 11 years experience working in all aspects of the fire sprinkler industry and has joined us as Project Supervisor. We are delighted to have them on board.